The ELI Housing Team is here to help you to choose the housing option that is right for you! The ELI is happy to help students to find a place to live while they are studying in Delaware! Several housing options are available; however, the type of housing that you can choose may depend on the ELI program that you will do. Before deciding where you want to live, consider your housing priorities and the options below. If you need assistance understanding the information on this web page, please email: eli-housing@udel.edu. To begin, please click on the name of the program that you will do (see below). Important housing requirements: Conditionally-admitted students have special housing requirements that they must meet. If you are registered for Academic Transitions or the Pre-AT program, you must fulfill the housing requirements as part of your program. This is very important. In each of these options, students will live with Americans. This helps students to learn more about American culture and encourages students to use English in their living environment. Are you bringing your family to Delaware? Students enrolled in International Edge will live on campus in the residence halls (i.e., dormitories). For more information, contact eli-housing@udel.edu. Housing options for participants in the DEFT program depend on two factors: 1) whether the participant is part of a special group; and 2) the duration of the program. DEFT participants that will come to the ELI as part of a special group will have their housing coordinated by the ELI’s Assistant Director for International Programs, Baerbel Schumacher (baerbel@udel.edu). This information will be provided to the group coordinator during the contract negotiations. Participants in the Executive English Program need housing that is available for only a short period of time (i.e., 3 weeks). Please contact eli-housing@udel.edu for more information about the options that are available for you. Be sure to follow instructions for reserving your housing! It is very important to follow the correct procedure. 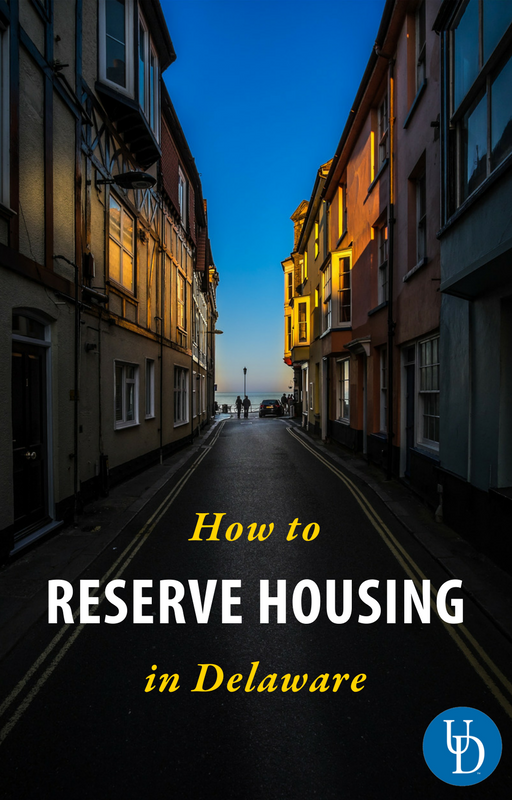 All students must submit a housing reservation form at least 2 weeks before the session begins. About 1 month before the start of the session, you will be emailed a link to the housing reservation form. You will need to provide a copy of your visa and your plane ticket reservation (i.e., your flight itinerary). Note: If you are already studying at the ELI, then you do not need to submit the visa and plane ticket reservation. Wait to receive your housing confirmation. The confirmation message will be sent to you by email approximately 1-2 weeks before the beginning of your session. Depending on your housing selection, you may receive a confirmation earlier. Do not delay! Some housing options may not be available every ELI session, so we recommend that you complete your housing application as early as possible to increase your chances of getting the housing you chose. Housing assignments depend on the date the ELI receives your completed application and the number of students attending that session. Why reserve housing through ELI? The ELI housing options are all inclusive – furniture, utilities (water/electric/heat/AC) are all included in the rental price. On move in day when you arrive at your Delaware home, everything in your apartment is ready for you. The WiFi is ready to use, all your furniture is there, and we help you move in! All ELI apartment options are on the UD Bus route so you do not need a car to get to class! The ELI Housing Office will help you make your reservation, answer any questions you have, and help you communicate with the apartment management. This is very helpful for people learning English! The ELI Housing Office will help you with any concerns or problems that you experience in your housing. We may not be able to help you if you reserve housing outside of the ELI Housing Options. If you have friends who studied at the ELI, they might want to give you advice about finding housing or where to live. Please keep in mind that your friends’ advice might not be “up to date” and it is important to get accurate information from the ELI before you make your housing plans! If you are an AT or Pre-AT student, you are required to live in AT Housing. You are required to reserve your housing through our office so that you are registered in AT Housing to meet the requirements of your conditional admission. There are several words and phrases to know so that your housing experience goes smoothly! We know that leases are difficult to understand, so we are here to help you understand your lease. Remember, before you sign a lease, we recommend that you ask the apartment management if you have any questions. It is your responsibility to understand your lease. When does my lease start? Do you take cash/check/credit card/money order for rent? How do I renew my lease? When is the deadline to renew? Do I need to take an inventory of the apartment condition after I move in? Remember, do not sign a lease unless you understand what you are signing! If something is damaged or is not working well in your apartment, it is very important to tell the apartment management. If you have any problems with the water; such as a leak or water dripping, you must report this immediately! If you do not tell the management about the problem immediately, then you may be held responsible for it and any damage it causes. You can copy and paste this sample email to send a maintenance request to the apartment management with the details about the problem in your apartment. If you do not know who to contact, email eli-housing@udel.edu for help. I would like to submit a maintenance request. I live in apartment __[your apartment number] __. In my apartment, the __[describe the problem] __ does not work. The problem started on __[date]___. Would you please send someone to fix this problem? Please send me a reply to confirm that you received my email. Not all housing options are available each session. Be sure to check with the ELI Housing Team (eli-housing@udel.edu) to make sure that the housing type that you like will be available while you are studying at the ELI. It is important to indicate your favorite choice and your second choice on your housing application so that the ELI can try to place you in a housing type that you like. By moving into ELI housing, you are automatically agreeing to the ELI Housing Terms and Conditions. I am coming to the ELI with my family and we need an apartment that has more than 2 bedrooms, what should we do? Contact ELI-Housing@udel.edu with your name, student ID, and the number people in your family including their ages. The Housing Coordinator can help you look for suitable options that are close to campus and the ELI. There are several dining options for ELI students. Some students buy a university meal plan, while others will eat with their homestay families. Some students choose not to buy a meal plan and will instead cook their meals or purchase them in many cafes in the Newark area.